If you’re in a locale like me where it’s deep into the winter season, I bet you can’t wait for spring to arrive! I know I can’t! To get you in the mood for a touch of spring, I’m sharing a series of Spring Edits across some of my favorite brands & retailers to give you a taste of what’s to come style-wise in the months ahead. Today’s post is all about some of the best classic pieces that Banana Republic currently has on deck for women's fashion this spring season! One of the reasons I love Banana Republic is that they offer an array of size options for women. They range from Size 000 (yes, triple zero!) to Size 20; and they also carry Petite & Tall sizes, too! Also, another major plus for me is that they pretty much stay true to classic-looking pieces (that withstand the test of time), while including timely modern updates season to season. Here’s a closer look at some of my favorite pieces from their Spring collection that you can shop right now! 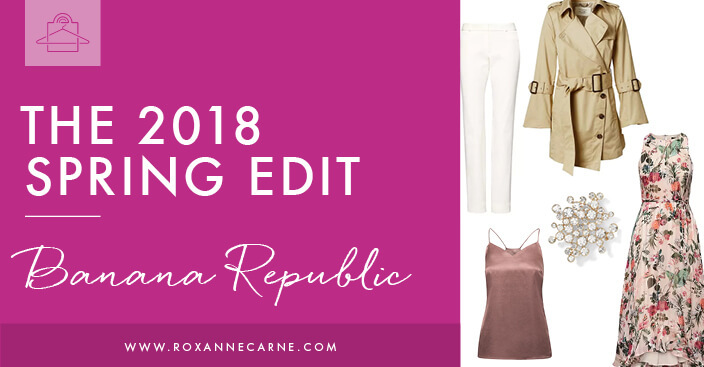 Here's my Spring Edit of 18 pieces I’m currently in love with from Banana Republic. Check out some highlights of my absolute favorites first and then scroll down to see the full spread! Who said brooches are only for old ladies? I don't think so! Wear a brooch as an accent piece on your favorite jacket, scarf, or sweater. Have that be your statement piece! Yes, cropped jeans (and pants for that matter) are still very much trending, and they’re trucking along right into Spring 2018 fashion. Get your pair adorned with raw hems to wear with your favorite pumps or sandals. These are making a comeback this Spring! Satin camis are a great option to wear under a suit jacket at work or under a denim jacket for an effortless casual look. Pair this V-neck blush cami with a modern statement necklace, and you’ll be on your way! Can we say curves for days? This skirt is undoubtedly one of my top faves from this edit. If you have a bigger bust up top, this skirt is a smart choice for proportion and balance. I’m in love with the fitted pencil cut in the hip area, asymmetric lines, and gentle flounce with wide ruffles. The ruffled pencil skirt is a showstopper and must-have for your closet this season! Want a transition piece that you can dress up or down? Look no further as this uber stylish cashmere capelet sweater fits the bill! It offers flow, movement, and a semi-fitted bodice that highlights your silhouette – great for various sizes! Last but certainly not least is the revered trench coat. If you’ve been following me for a while, you know how strongly I feel about trench coats! Another must-have for your wardrobe. 😉 Banana’s trench offers a fresh, modern twist on the traditional version by going with a single-breasted construction, an asymmetric button line, and gently fluted sleeves. Isn’t it just darling?! Be sure to pick one up before they sell out! 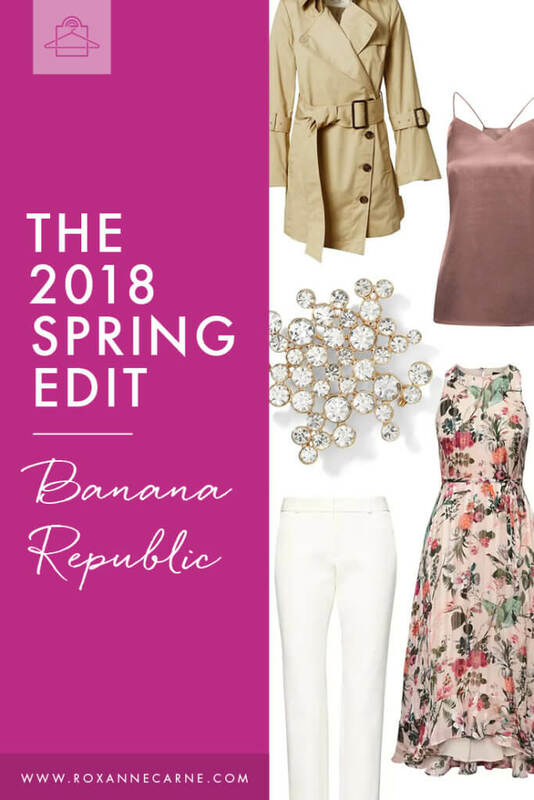 Check out my Top 18 selections from The Spring Edit: Banana Republic just below. Shop the look by clicking on an item’s image below! Don’t miss out as these popular items won’t be available for long! So there you have it! Which pieces from this edit are YOUR favorites? Comment below!